VW, Audi, SEAT, SKODA – worldwide. Used by Lamborghini production, Bugatti production, McLaren production, Mercedes seat production, BMW seat production. Used , sold and recommended by major furniture chains throughout Europe. Most leather covered seating in European Airports. McDonalds Service and Restaurant Outfitters use these products on their leather and vinyl seating. Lufthansa Technik in the service of their airline fleet. Do I need a cleaner, conditioner and protector? It is quite Ok to purchase one, two or all three products. They all have different jobs to do. The Leather Cleaner is for removing general soiling, minor stains, and spillages etc as well as aiding in the prevention of body oil and sweat build up and associated damage, especially on headrest and armrest areas. The Conditioner (Fadegard Leather Conditioner) nourishes and feeds the leather to keep it soft and supple and prevent it from drying out. It also contains UV filters to slow and protect against sun damage and fading. The Protector (Leather Shield Protector) prevents and reduces friction damage on high contact areas (seats and arms on furniture, or entry areas on car seats), as well as dye transfer from jeans and clothing. (Especially important on light coloured leathers). Are Colourlock products safe for my family? Yes, all Colourlock products are manufactured using non-toxic and non-allergenic raw materials, chemically neutral and biodegradable. Have Colourlock products been independently tested to meet international standards? Should I test the product before application? Yes. With all products, always test first, on an unseen area, (under a seat cushion or similar) then if it looks OK, you can start on a seat cushion or arm, apply product to the side and slowly work your way into the centre. Will the products darken my leather? With some types of leather (aniline or semi aniline) the leather may darken temporarily after cleaning or conditioning. The colour should return to normal after 12-24 hours, once the moisture has dried. Can I buy Colourlock products outside New Zealand or Australia? Yes, Colourlock products are available in over 70 countries worldwide. If you need to know where they are available in your country, please ask us for details. What do I do if I have a specific problem or query? Please use the Contact Us page and email us any product related questions you may have. All prices are in New Zealand dollars (NZD) and are shown with GST). You will be charged in NZD. GST is not added to the Shipping cost. All purchases must be paid in full prior to dispatch. Colourlock uses New Zealand Post and Fastway Couriers to send item(s). All Mail Orders will be dispatched to customers within 1-3 working days once authorisation of payment has been received. Although mail is sent out every day, please allow 3-5 working days to receive your goods within New Zealand. Please allow 7-14 days for delivery outside of New Zealand. Colourlock cannot guarantee delivery timeframes. Please note that during the Christmas holiday period, delivery times might be slightly longer than normal. Shipping costs are calculated in the shopping cart and will be added to the order total before checkout. We accept Visa and MasterCard. Payment is made using PayPal. Payment details are sent over a Secure Server for your protection. No credit card details are stored on this website or on our server. For New Zealand orders we also accept payment via Bank Transfer. The name that will appear on your statement will be COLOUROCK LEATHERCARE. If you receive goods damaged on arrival, please contact us immediately, so the issue can be resolved. Only unopened products may be returned for refund. We are committed to ensuring the privacy of our visitors and customers. Under no circumstances will our visitors or customers data including email addresses etc be given to any third parties. We are fully dedicated to the complete privacy of all customer information. For customers purchasing goods through this website, the required purchase information is guaranteed to remain confidential. Under no circumstances will we sell or share your personal information with a third party that is not directly involved with your transaction. If you have any questions about this security/privacy statement or the practices of this site, please contact us. We are a fully New Zealand owned and operated business. 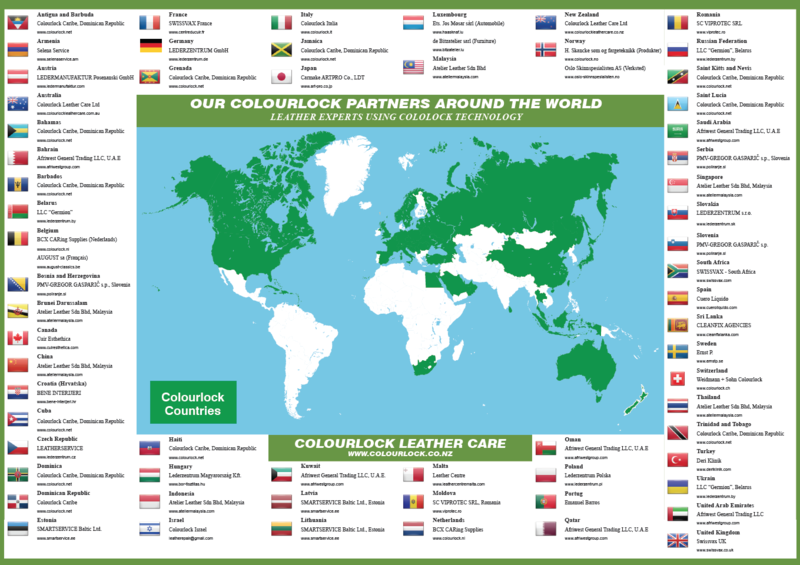 We are a registered New Zealand company: Colourlock Leathercare Ltd.